Sarika Singh is a partner in the New Jersey Office of McNeely Hare & War. Sarika Singh is an intellectual property attorney with extensive experience in patent procurement, litigation, and counseling in the field of pharmaceuticals, chemicals, nutraceuticals, polymers, biochemistry and biotechnology. She has significant experience in advising clients on Hatch-Waxman patent and regulatory law, and provides patent infringement, validity, freedom to operate and clearance opinion relating to ANDA (Abbreviated New Drug Application) preparation and submissions. She has represented clients on both generic and branded sides in Hatch-Waxman litigation. She has prepared and prosecuted patent applications covering a wide variety of technology including therapeutic small molecules, biologics, medical and diagnostic devices, processed food, and polymers relating to inks, artificial leather, and optical devices. 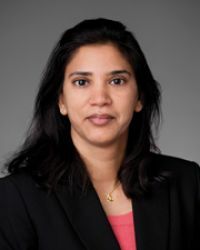 Before returning to McNeely Hare & War, Sarika practiced patent law for several years in the New York offices of the international law firm, McDermott Will & Emery LLP. Prior to joining McDermott, Sarika worked at McNeely Hare & War as a patent agent and then as a patent attorney. While attending law school and prior to that, Sarika worked for nine years in positions of increasing responsibility in the intellectual property department at Ranbaxy, a major international pharmaceutical company, including as director of global intellectual property. Her experience at Ranbaxy included managing and supporting multi-country patent litigation throughout Europe, South Africa, Russia, CEE, and Canada besides patent infringement, validity, freedom to operate and clearance analysis, patent preparation and prosecution, and pre-launch litigation risk assessment and strategy development. Earlier, before and after her Ph.D., Sarika worked for three years as a chemist in process development and up-scaling of pharmaceutical active ingredients. Thanks to her considerable experience in the pharmaceutical industry, Sarika brings real world scientific and business perspective to her practice. Sarika is licensed to practice in the states of New York and New Jersey, and admitted to practice in the U.S. District Courts for the Southern and Eastern Districts of New York, and the U.S. District Court for the District of New Jersey. Sarika is a member of the American Chemical Society (ACS). Sarika frequently writes and speaks on current developments in intellectual property law. Sarika is also active in providing pro bono legal services. Sarika received her J.D. from Rutgers School of Law, Newark. Sarika has a Ph.D. in synthetic organic chemistry, masters in chemistry with a major in organic chemistry, and bachelors in Chemistry, Physics and Mathematics from the University of Delhi. Shire LLC et al. v. Impax Laboratories et al., 3:10-cv-05467 (N.D. Cal). Represented Shire in patent infringement action against Watson and Impax following para IV ANDA filing for Intuniv® (guanfacine). Parties reached a licensing-based settlement. Teva Neuroscience, Inc. et al. v. Watson Pharma, Inc. et al., 2:10-cv-05078 (D.N.J.) Represented Mylan in patent infringement action for Azilect® (rasagiline) patents following FTF para IV ANDA filing..
Pfizer Inc. v. Ranbaxy Labs. Ltd., 06-1179 (Fed. Cir.). Developed grounds for non-infringement and invalidity to support Ranbaxy’s defense in patent infringement action for Lipitor® (atorvastatin) patents following FTF para IV ANDA filing. One of the patents protecting atorvastatin was invalidated. Astellas Pharma Inc. et al. v. Ranbaxy Labs. Ltd. et al., 3:05-cv-02563 (D. N.J.). Developed grounds for invalidity to support Ranbaxy’s defense in patent infringement action for Flomax® (tamsulosin) patents following FTF para IV ANDA filing. The case settled prior to a decision by the Court of Appeals for the Federal Circuit. AstraZeneca AB et al. v. Ranbaxy Labs. Ltd. et al., 3:05-cv-05553 (D. NJ). Developed grounds for non-infringement and invalidity to support Ranbaxy’s defense in patent infringement action for Nexium® (esomeprazole magnesium) patents following FTF para IV ANDA filing. Ranbaxy obtained a favorable settlement of the case. “Pro se not welcome at PTAB,” AIPLA Newsstand, December 30, 2014. “Patent owner’s General Counsel allowed to substitute designated counsel at oral hearing,” AIPLA Newsstand, November 26, 2014. “‘Soda-pop’ bottle caps can be analogous art for flash chromatography cartridges,” AIPLA Newsstand, October 29, 2014. “Silence of ANDA with respect to a claim limitation does not constitute infringement,” AIPLA Newsstand, October 1, 2014. “Res judicata does not bar claims arising after prior litigation,” World Trademark Review (Legal Updates), August 8 2014; AIPLA Newsstand, August 8 2014. “Objective evidence based on unclaimed species insufficient nexus,” AIPLA Newsstand, July 30 2014. “Implied license limited to continuation applications, not to provisionals,” AIPLA Newsstand, April 30 2014. “Perils of Flirting with Means-Plus-Function Limitation,” National Law Review, November 26, 2013. “Form over substance? – no review of patent validity on remand if accused infringer failed to file a cross-appeal after a judgment of non-infringement,” AIPLA Newsstand, May 31, 2013. “Patent marking: an extrajudicial admission that the product is covered by the patent but not an estoppel,” AIPLA Newsstand, April 30, 2013. “Judicial estoppel bars flip-flop within the same case as to ownership of patents,” AIPLA Newsstand, July 2012. “Generic Drugs – Hatch-Waxman Act as amended by the Medicare Modernization Act,” Global IP Convention, New Delhi, January 2012. “Diagnostic Method Patenting After Bilski,” American Conference Institute Guest Blog, September 2010. Panelist, “Early Access Agreements In Pharma.” Licensing Executives Society, Vancouver, October 2007. “Deoxygenation of Sulfoxides and Selenoxides with Nickel Boride” Jitender M. Khurana, Abhijit Ray and Sarika Singh, Tetrahedron Lett. 1998, 3829. “Reductive coupling of Nitroarenes to Hydrazoarenes with Al-KOH in methanol”, Jitender M. Khurana and Sarika Singh, J. Chem. Soc., Perkin Trans. 1., 1999, 1893. “Oxidative hydrolysis of Hydrazones, Semicarbazones and Phenylhydrazones with Sodium hypochlorite”, Jitender M. Khurana, Sarika Singh and Atulya K. Panda, J. Chem. Res. (S) 1996, 532. “Oxidative Coupling of Thiols to Disulfides”, Jitender M. Khurana, Arti Sehgal and Sarika Singh, Ind. J. Chem. 1997, 36 B, 819. “Reduction of Nitroarenes with Sodium dithionite”, J.M. Khurana and Sarika Singh, J. Ind. Chem. Soc. 1996, 487.